In the late renaissance (c. 1580-1600) and in the baroque (c. 1600-17??) periods many different types of extended lutes were popular. One group of these was called by names chitarrone, tiorba, theorbo, theorboe, theorb, .... Common to this group was a special way of tuning the two (sometimes one) "highest" strings one octave lower compared to other groups of lutes. This created a little "harp like" sound and sonority to these instruments. 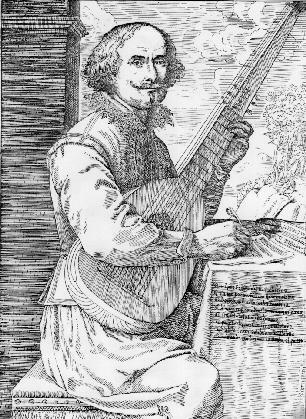 Robert Spencer's article Chitarrone, Theorbo and Archlute is a well written introduction to the extended lutes. The chitarrone in these videos is model Magno Dieffopruchar 1608, Venezia (Royal College of Music No.26) made by Timo Kontio 2003. Pieces by Bellerofonte Castaldi from his printed book "Capricci a due stromenti / cioe tiorba e tiorbino / e per sonar solo / varie sorti di balli e fantasticarie" played by a small theorbo/chitarrone. Actually Castaldi himself is playing quite small an instrument in a picture in his book! My instrument here is an archlute (Stephen Barber, 1987) stringed and tuned to a high theorbo. Alessandro Piccinini: Toccata IV (1623). This Toccata was printed in the "Intavolatura di Liuto et di Chitarrone, Libro Primo", Bologna 1623. The instrument is theorbo (chitarrone), model Magno Dieffopruchar 1608, Venezia (Royal College of Music No.26) made by Timo Kontio 2003. Video in YouTube, video in Vimeo (25.3.2013). Gio. Girolamo Kapsperger: Canario (1640). This Canario by Kapsberger was printed in his "Libro Quarto d'Intavolatura di Chitarone", Roma 1640. The instrument is theorbo (chitarrone), model Magno Dieffopruchar 1608, Venezia (Royal College of Music No.26) made by Timo Kontio 2003. Video in YouTube, video in Vimeo (28.3.2013). Gio. Girolamo Kapsperger: Capona (1640). This very strange piece by Kapsberger was printed in his "Libro Quarto d'Intavolatura di Chitarone", Roma 1640. The instrument is theorbo (chitarrone), model Magno Dieffopruchar 1608, Venezia (Royal College of Music No.26) made by Timo Kontio 2003. Video in YouTube, video in Vimeo (1.4.2013). Gio. Girolamo Kapsperger: Corrente 7ma (1640). This very chromatic Corrente by Kapsberger was printed in his "Libro Quarto d'Intavolatura di Chitarone", Roma 1640. The instrument is theorbo (chitarrone), model Magno Dieffopruchar 1608, Venezia (Royal College of Music No.26) made by Timo Kontio 2003. Video in YouTube, video in Vimeo (3.4.2013). See also my pages 11-course lute music / French theorbo music / Archlute music / 10-course lute music / Chitarrino music.